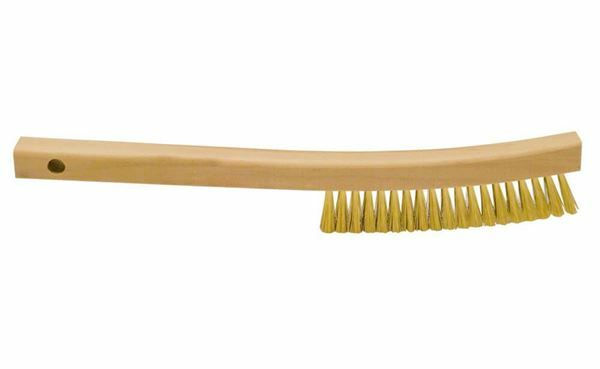 Coarse Screen Tray Brush - Gilson Co.
TSA-171 Coarse Screen Tray Brush is recommended for No. 30 and coarser wire cloth in screen trays. The 13in (330mm) curved wooden handle has 5-1/2inx3/4in (138x19mm) fine (0.005) brass wire bristles that slant toward the tip for easy cleaning screen tray corners. Also useful for cleaning molds. TSA-171 is available individually and as an included component of TSA-167 Clean-N-Weigh Accessory used with a range of Testing Screen & TestMaster® Trays.